Now I like a nice amped and noisy gig with the best of them but there is something particular and special about an essentially acoustic show. There’s no sliding over the odd mistake, no covering up with an extra flourish or shouting your way past the fact that you didn’t quite nail that note. So a show like tonight really highlights the qualities of superb musicianship, talent and artistry. I had rather expected the charming Heidi Talbot to be acting as support, but none of it. From the off we had Messrs McCusker, Drever and Woomble onstage with Ms Talbot and the understated Mr McKenzie (hope I remembered this right, can’t seem to check him out, apologies ! – you can see now that I got that totaly wrong 😦 ) Kevin McGuire on upright bass (many thanks to Fiona Clark for the very welcome correction). The evening was a satisfying mix of material from everyone’s catalogue. Everyone seemed in very fine fettle but I was impressed anew by the formidable and considerable talents of Orcadian Kris Drever, as a guitarist, composer (the wonderful Black Water – thanks to Derek MacDonald for pointing out Black Water was written by sandy Wright, not doing so well this post am I !) and singer. Boo Hewerdines great Harvest Gypsies, delivered by Mr Drever,was an outstanding song of the evening. The harmonies of Drever and Woomble on many other songs, two of my favourite vocalists, were tingling. John McCusker is himself a fine musician, no wonder he is in such demand by the likes of Mark Knopfler and his fiddle playing was showcased with a medley (does that sound too Light Programme?) of his own songs. Heidi Talbot too is no slouch and her fine voice not only supported many of the songs but also got full rein on one or two of her own songs. I would be lying if I didn’t confess largely coming to these other musicians through the music of Roddy Woomble whose exemplary solo and collaborative albums have been a source of great pleasure these last few years. I find something deeply comforting in the Caledonian brogue, the twists and inflections of Scottish songwriting, I am sure it resonates both with my real (if a little distant) Scottish roots and a desire for a more profound cultural inheritance than I currently feel. The favourites from My Secret Is My Silence and The Road to Ruin – Waverley Steps, Silver and Gold and the rest, were all in evidence. These ten or so dates have been flagged as the last outing for the Ruin songs, and in truth there was a slight feeling of an ending about tonight. 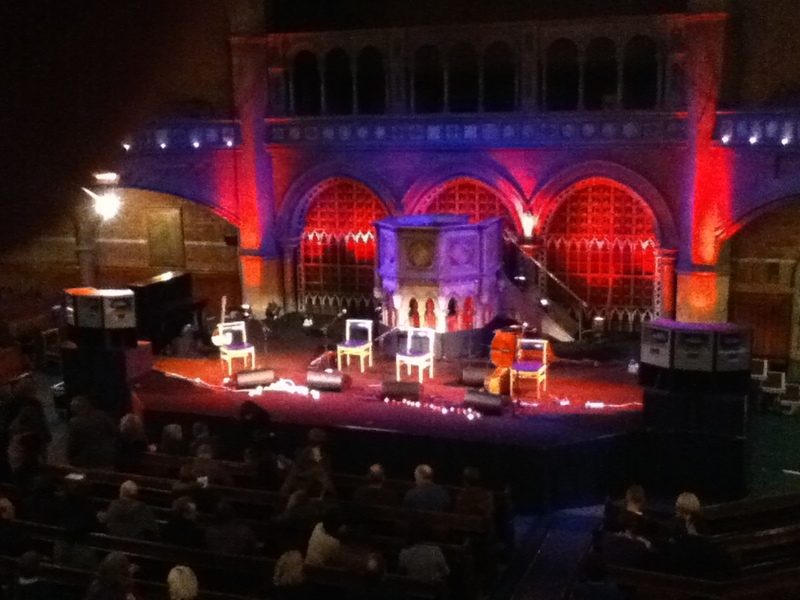 But another collaborative offering has been suggested and a new solo Woomble album is due next year – a 27 March 2011 date again at the Union Chapel is already fixed and others are on the web. Some music reaches in deep and this is such music, material I know I will return to time and again over the years, music that will stand the test of time, it’s a joy to see it live (for a second time) and more than compensates for the schlep to and from London and the loss of domestic brownie points. This entry was posted in Uncategorized and tagged Boo Hewerdine, Gig, Heidi Talbot, John McCusker, Kris Drever, Roddy Woomble. Bookmark the permalink. We were very fortunate to have so much talent in one room. Great review, wish I could have been there. Did see Heidi, John and Boo recently in Stirling and seeing Kris, John and Donald Shaw in Glasgow this weekend. Worth pointing out that while Kris does write a great song Black Water isn’t one of his, it was written by the legendary Sandy Wright (who has a couple of songs on each of Kris’s albums). He certainly does do it well. Hopefully it’ll be on the setlist for St Andrews in the Square tomorrow night! Ah well lucky you – enjoy St Andrews Sq!